The Accreditation Council for Business Schools and Programs (ACBSP) has reaffirmed our Business Administration degree program accreditation, which we’ve held since 2002. ACBSP also granted accreditation for our new Accounting degree program, one of only seven in the country to receive accreditation separate from the business program. I’ve talked before about how colleges get accredited and why it’s important to students, alumni, and the entire institution. For a refresher, the ACBSP is a leading specialized accreditation association for business education programs. The organization promotes continuous improvement and recognizes teaching excellence in the accreditation of business education programs around the world. The ACBSP has accredited over 330 U.S.-based business programs and over 70 business programs outside the U.S.
Peirce College is one of just 32 colleges and universities worldwide with a business program accredited by ACBSP at both the associate and baccalaureate levels. This is a testament to our commitment to quality education as well as our efforts to provide superior student support services. Thank you to all who were involved in making this happen -- it takes a true team effort to continue to achieve this recognition. 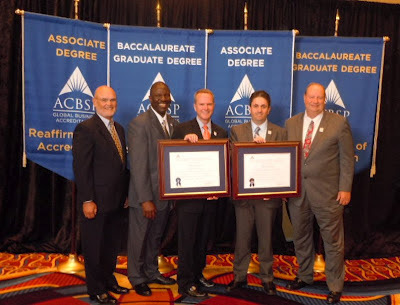 ACCREDITATION CELEBRATION: Mike Schirmer and Ahmed Omar accept the ACBSP accreditation on behalf of Peirce's Business Administration and Accounting degree programs. Pictured (left to right): Ronald DeYoung, Executive Liaison, ACBSP Staff to the Baccalaureate/Graduate Degree Board of Commissioners; Anthony Negbenebor, Chair-Elect of the Baccalaureate/Graduate Degree Board of Commissioners; Mike Schirmer, Faculty Chair, Business; Ahmed Omar, Program Manager, Accounting; Steve Parscale, Director of Accreditation for the ACBSP.